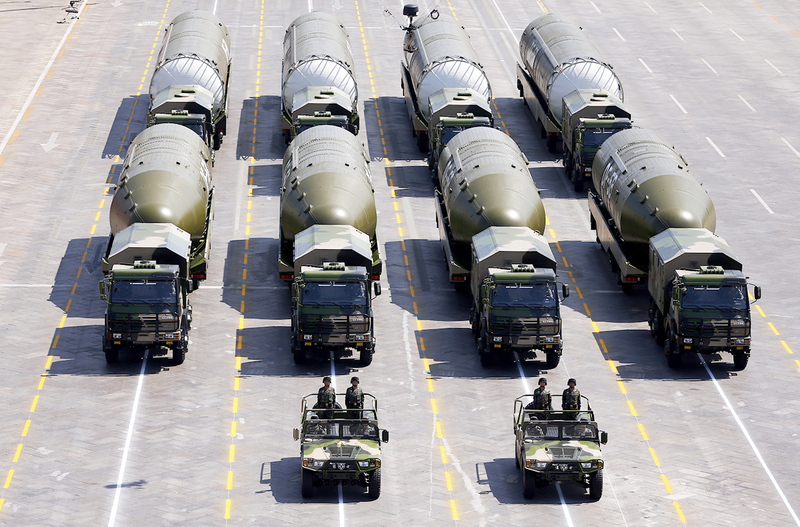 The DF-5B nuclear missiles attend the military parade in Beijing. Beijing’s alleged deployment of the new Dongfeng-41 nuclear capable ballistic missiles near the China-Russia border is not aimed against Russia, but could be a signal to the new U.S. President Donald Trump that China has the means to protect its interests. China’s state-owned Global Times, on Jan. 23, carried a report, which said the Dongfeng-41 (DF-41) missile would bring China “more respect.” The missiles that are capable of carrying 10-12 nuclear warheads were deployed near the China-Russia border, according the report, which did not go into further detail. Two days earlier, Pingguo Ribao, a Hong Kong-based publication reported about the deployment. News of a potential deployment leaked much earlier. In December 2016, photos of the launchers of intercontinental ballistic missiles, taken on the streets of Daqing in the Heilongjiang province, (which borders the Primorye and Khabarovsk territories), were circulated on Chinese-language military online forums. One can safely assume from the timing of the Global Times report (China’s Foreign Ministry denies the deployment took place), which coincided with the inauguration of Donald Trump, that a message was being sent out to the new president of the United States. Trump made a series of harsh anti-Chinese statements and gestures before and after the presidential elections. The Global Times clearly suggested in its report that Beijing wanted to show that it intends to firmly defend its interests and has the resources to do so. The deployment of the DF-41 in the province of Heilongjiang is certainly not directed against Russia. First of all, by being so close to the Russian border, the Chinese missiles would be vulnerable to Russian ballistic short-range missiles, cruise missiles and aircrafts. Beijing is also comfortable in the knowledge that Russia’s main cities are within the target range of China’s medium-range DF-21 and DF-26 missiles. These missiles outnumber the DF-41, and are more accurate. In all probability, the location of Daqing (about 650 kilometers from Vladivostok) should hinder the U.S. from targeting the DF-41 missiles with a hypothetical first blow. Such a blow could be mistakenly identified by the Russian missile warning system as an attack on Russia and result in unpredictable consequences. An attempt to strike the DF-41 positions using cruise missiles or aviation requires crossing the airspace of Russia or North Korea, making it a risky move. China may have also chosen its northeast for the deployment since the flight time is reduced for potential strikes on the U.S. east coast. The planned deployment was apparently known to Russian intelligence agencies, which could explain the Kremlin’s quick and relatively calm reaction to the news. Until now, China has possessed two basic types of intercontinental ballistic missiles capable of reaching the United States. The first and foremost is the DF-5 liquid-fuel missile, which has in recent years been upgraded to the DF-5B. This upgrade includes equipping the missile with the multiple independently targetable reentry vehicle (MIRV) warhead. However, these 180-ton missiles are kept in tunnels and require up to one and a half hours to be launched. The DF-31 and DF-31A mobile solid-fuel intercontinental missiles came into service in the early 2000s. They can be compared with Russia’s Topol-M. The DF-31A can be considered China’s first effective deterrent against the American nuclear weapons. However, it cannot hold enough nuclear warheads to overcome the American missile defense system. The DF-41, which is a solid-fuel missile, provides a serious challenge to the Americans. It is heavier than the DF-31, but compact enough to enable stealth and mobility.